Gasson Hall in 1913, soon to open. Photograph: Courtesy of John J. Burns Library Archive. Click image to enlarge. 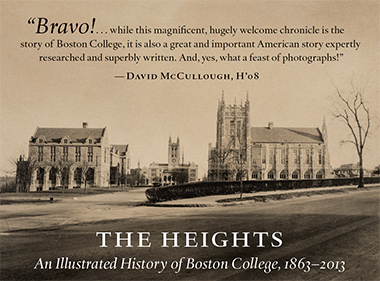 Editor’s note: The following was expanded from the introduction to The Heights: An Illustrated History of Boston College, 1863–2013 (Linden Lane Press, 2014), a book commissioned for the Sesquicentennial and coauthored by Ben Birnbaum and Seth Meehan, Ph.D.’14. Sunt lacrimae rerum, et mentem mortalia tangunt. “These are the tears of things, and our mortality cuts to the heart,” goes a somewhat opaque but oft-cited translation of this line from Book I of the Aeneid. As set out by Virgil, the circumstances are these: Seven years after fleeing fallen Troy on his way to Italy, where he will plant the colony that will raise up Rome, Aeneas lands in Carthage, in North Africa, where he is welcomed and taken to the temple of Juno to await an audience with Dido, the Carthaginian queen (with whom he will have a famous goddess-induced affair that ends badly for her, to say the least). And he looks up at the walls, as people who are waiting will do, and discovers frescoes portraying aspects of the lengthy war in which he’s lately fought: A wounded young man is dragged over the ground by his horse; Achilles postures beneath the walls of Troy with the corpse of Hector (Aeneas’s friend) at his feet; the women of Troy, their hair unbound in a gesture of submission and grief, beseech Athena for mercy she will never extend. And Aeneas, seeing these things, weeps, calling out to his lost king, Priam, in the words quoted above. While not all scholars agree on what Virgil intended here, the consensus is that Aeneas, though he weeps, is not mourning. Rather, he is exulting that the Carthaginians, no friends of Troy, have been so moved by stories of Trojan suffering that they have preserved those narratives in “things” that are more durable than human lives and that will, so long as they exist, compel human feeling. This, he believes, is proof that Troy’s glory was not buried in the city’s rubble but will live on in the empire his descendants establish. Photograph: Young men with mandolin; the original Boston College campus, on Harrison Avenue in the South End, included the courtyard students referred to as “Boston College’s Common.” Photograph: Courtesy of Georgetown University Special Collections. Click image to enlarge. We are meaning-making creatures and, like Aeneas, can’t help but find narrative (even prophecy in his case) in “things,” particularly when they are resonant with past time and lost places, as were the frescoes, as is the image on the cover of this magazine. What is clear is that the photograph was taken in the spring of 1913, as construction—delayed two years by funding shortfalls—finally neared conclusion. This was maybe a month or so after a group of Boston College seniors, yearning to spend the last days of their college education beneath a stone tower on a green campus, and not crammed into a red-brick building shared with a high school and lodged between a cemetery and a public hospital, put on their bowler hats, took up their leather schoolboy briefcases, and rode the trolley to Lake Street to “take possession” of “a big, sunny” classroom on the second floor of the Recitation Building. The students are not in the photograph, however, but a small group of nicely fitted-out visitors is, which most likely means that it is Sunday in this picture, the only day of the week on which classes were not held and workers didn’t work, and a favored day for trolley excursions to the greensward that banked the twin reservoirs below Chestnut Hill. And while out there, why not climb Commonwealth Avenue and get a close look at that building that appeared to have been carried in from Europe on a tide that washed it up on the old Lawrence Farm? Whether this is the story of the nicely fitted-out visitors, we don’t know. But there’s evidence to suggest that it is: the man standing alone at left rear who seems to have his hands in his pockets as he considers things, the women walking together and discussing matters, and another man escorting a beautifully outfitted young girl away from the building, as fathers have forever escorted young daughters (and sons) away from wonders that children did not find wondrous. The photographer, in any case, seems not to have cared about capturing these people. None of them is in focus. The building is. And the photographer, we can reasonably imagine, can’t wait for these gawkers and strollers to get out of the way. Meanwhile, he or she might as well squeeze off a test shot that turns out to capture the wonder of Boston College at its dawn, pure hope and possibility, before time began to tick in the still-clockless tower. The 1897 football team on the steps of the James Street entrance to Boston College’s first building. Photograph: Courtesy of John J. Burns Library Archive. Click image to enlarge. Institutions produce two kinds of “illustrated histories.” One is the family album, designed to draw responses akin to “Oh, look how handsome Bill was. And so young.” (Such a volume was published by Boston College in the late 1980s.) The other kind makes its case as history, with illustrations. The Heights is of that kind. Though hundreds of images—many in print for the first time—appear on its pages, it is foremost about what Boston College did over the days of 150 years, and how those years shaped Boston College, as best we can know these things. Boston College history isn’t an easy road. The University was for many of its years short on space, money, and the kind of confidence that spurs institutions to take their history seriously. George Higgins ’61, JD’67, one of the two best fiction writers ever to graduate from Boston College (the other is Higgins’s classmate David Plante), used to say that the University was afflicted with “Irish G’wanism,” as in “G’wan, it’s only Boston College.” And the attention paid to collecting and preserving the sources of Boston College’s story—its primary documents and its artifacts—was modest at best until the Burns Library opened, in 1986. On June 19, 1909, University President Thomas I. Gasson, SJ, displays the first sod turned for construction of the Recitation Building (now Gasson Hall). Photograph: Courtesy of John J. Burns Library Archive. Click image to enlarge. A greater difficulty for the would-be historian, however, is that the Jesuit curia in Rome and the Jesuit Province of Maryland (in which Boston College was entered until the New England Province was created in 1926) held sway in the South End and then on Chestnut Hill into the 20th century, with Roman oversight of some University business continuing into the Walsh presidency (1958–68), much to Fr. Walsh’s unconcealed annoyance. Other material critical to understanding Boston College, particularly during its early years, ended up as a subdivision of the Maryland Province archives at Georgetown University, where Meehan became the first representative of Boston College to find historic value in such “things” as a letter to the provincial in which the ingenious John McElroy, SJ, in making his argument for a Boston College, imputed scandalous behavior—drunkenness and disobedience, to be precise—to Jesuits at the College of the Holy Cross, which had been founded in 1843, and whose leaders did not want to see a competing institution spring up just 45 miles to the east. Members of the junior auxiliary division of the Philomatheia Club, photographed October 18, 1931. Behind them are the private homes on College Road that would become Heffernan House and Hopkins House. Photograph: Courtesy of John J. Burns Library Archive. Click image to enlarge. Still, Boston College history was written. In 1890, according to a brief and somewhat cryptic note in the Boston Globe, an edition of the St. James Bulletin (likely published by the St. James parish that lies just to the north of Boston College’s first home) “contained quite a lengthy history of Boston College.” (Unfortunately, no copy can be found.) And over the decades, brief memoirs by old boys and older Jesuits turned up in the Stylus and Heights, recalling cloudless days and tender friendships. The first book-length history of Boston College, however, did not appear until 1947, more than 80 years after the founding. That volume, plainly titled A History of Boston College—and free of doctrinal or moral error according to the provincial, the censor, and Archbishop Richard Cushing—was written by David R. Dunigan, SJ, who directed the education department that would become the School of Education. Students are sworn into the Navy in the spring of 1942, in Bapst Library’s basement auditorium. At right onstage is University President William J. Murphy, SJ. Photograph: Courtesy of the Office of Marketing Communications. Click image to enlarge. An updated history was published in 1990 by the much admired (including by me) Charles Donovan, SJ, ’33, H’78, who’d been the founding dean of the School of Education and the University’s genial academic vice president before becoming, in 1979, the genial University historian (a post that had not previously existed). With the assistance of his coauthor, the equally affable historian Paul FitzGerald, SJ, who was then running University archives out of basement rooms in Lyons Hall (and who died before the book was completed), Donovan added 43 years to Dunigan’s saga—”From the Beginnings to 1990″ becoming the subtitle. Donovan edited Dunigan hard to make the new book work stylistically, which was unfortunate, because Dunigan was the more adept historian and writer, with an eye for the small details that swell out time and give it the odd and mysterious shape of what we recognize as history. And Fr. Donovan, it needs be said—who arrived on the Heights as a freshman in September 1929 and never left it except to do his Jesuit training and his graduate studies—also loved Boston College and believed in its inherent goodness, and had difficulty, at least as a historian, ascribing fault or foolishness to the institution or its people. When in the late 1980s I sent a writer from Boston College Magazine to interview him about the Gasson Hall takeover by black students in 1970, the writer returned, poked his head in my doorway, and said with intended irony, “Fr. Donovan says it didn’t happen.” Fr. Donovan did write about the building takeover in his book, though I can see why he preferred not to descant upon the subject. His Boston College was not a place where white students yelled racist remarks at black students in the upper windows of Gasson Hall. Nor a place where black students held a building and university hostage. And his history of Boston College reflects this. Boston’s Cardinal Richard Cushing and students at the dedication of McElroy Commons on November 9, 1961. Photograph: Courtesy of John J. Burns Library Archive. Click image to enlarge. And we would certainly make no claim that our pages on the Monan and Leahy years are “history.” They are at this time story. As Zhou Enlai famously said in 1972 when asked what he thought was the legacy of the French Revolution, “Too early to say.” Disappointingly, Zhou turns out to have understood the question as referring to the 1968 unrest in Paris. Still, the point holds. History is written on water. New sources are discovered, visits are made to Rome, new translations are published, locks are torn from gates that secured secret treasuries. One day a few years ago, at a reception in Corcoran Commons, I was unexpectedly introduced to Rick Atkinson, the (dual) Pulitzer Prize-winning historian and journalist who had just embarked on the third of his acclaimed books of World War II history. “So,” I said, reaching deep, “can there still be things to learn about World War II?” His reply was to look at me in silence. And the book is, of course, an illustrated history, which, given Boston College’s date of birth, means photographs. With the exception of Gary Gilbert’s 25 photo arrays and an appendix of Clifton Church’s stunning and unpopulated landscapes from the 1920s and 1930s, virtually none of the photos in this book were deliberately conceived as art, by which I mean that they pay attention not to themselves but to the subjects they are capturing, the moment in time that they are stopping—photography that begins as proof something happened, that Gasson broke ground with a shovel, that students in tuxedos danced with young women in gowns while a big band played, and that in 1942 young men who appear to be boys stood in the basement of Bapst Library and took an oath to serve for the duration of war. But as Virgil knew, images of the past are more than evidence. Susan Sontag knew it too, writing in On Photography that “all photographs are memento mori”—”a token of absence.” My heart agrees. Catching a life at the speed of light, we can’t help but glimpse the mystery of the darkness behind and the darkness ahead, which is why I am most moved by pictures in The Heights that deliver up those individuals who entered the scene innocently, bit players, extras, simply living their lives and never imagining they were making institutional memory, much less history. Students gather along the Dustbowl circa 1977, occasion unknown. Photograph: Courtesy of Donald Garnett ’77. Click image to enlarge. I have in mind the unknown young men who turn up under a tree (with mandolin) in a 19th-century photograph of the South End Campus. Are they students? We don’t know. And the 1897 football players surrounding their large captain, Arthur White, with one student (at the last second, I imagine) reaching to lay his right hand on the hero’s shoulder. And the delighted boy who has just watched Fr. Gasson—after two pantomimed failures—finally crack the sod on Chestnut Hill on June 19, 1909. And the women of the “junior auxiliary” Philomatheia Club, volunteer fundraisers for a college to which they could not be admitted as students, posing near Bapst Library in their hats and furs on a fall Sunday in 1931. And the students taking the oath in their jackets and ties and brilliantined hair. And the students on the steps of McElroy Commons on November 9, 1961, the day the building was dedicated, forever laughing at a crack by the famously sharp-witted and delighting (and irreverent) Cardinal Cushing. And four black women on the old Dustbowl on a winter day in the late 1970s, not entirely sure of the photographer’s intentions; maybe not entirely sure of other things as well. History there is in this book, as good as we could make it. But what life there is on these pages, that cuts to the heart and always will. Ben Birnbaum is the editor of this magazine.